You are very welcome to use this Logo on your web page, jerseys etc. if you aggree to its message. Please give credit to us by linking back to http://www.juggerblog.net or to this page; if you can also name Ein Uhu as the author, even better (Creative Commons-License cc nc-nd-by 3.0). 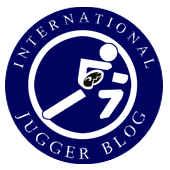 For patches and general usage term questions please refer to the German Jugger forum. The Logo does not display a Pompfe/Jugger spar smashing the Svastica because of the would-be association with a weapon, which a Jugger spar is definitely not.